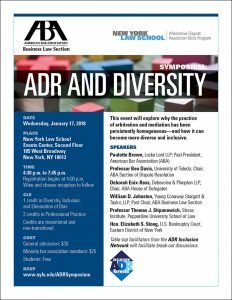 Last year, New York Law School and the ABA Business Law Section convened all three of the CEOs of the national ADR organizations, plus other leaders, to address persistent issues of lack of diversity in the mediation and arbitration profession. This year, on the afternoon of January 17, 2018, the same event will take place, featuring the past president and the current House of Delegate Chair of the ABA; the Chair of the ABA Dispute Resolution Section; Tom Stipanowich of Pepperdine; Judge Elizabeth Stong of EDNY; Jim Tricarico of Edward Jones; Bill Johnston of the ABA Business Law Section; and experienced facilitators from the leading ADR organizations and court programs around the New York region. If you are in the New York area on Wednesday afternoon January 17, you should come by. Three CLE credits, including one hour of the new required category, “Diversity, Inclusion and Elimination of Bias.” Registration is available here.